Want to find a way to connect with nature? 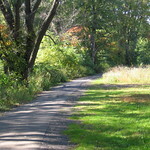 Pennsylvania has many beautiful parks that offer great ways to accomplish your goals! Whether you want to go swimming or just for a walk, these great parks are located all over Pennsylvania. Each have easy access points and allow for daily activities. So get ready, pack up, and pick a park to start your adventure today! Parking, restroom facilities, pavilion, river access, and camping is available. There is parking, restrooms, picnic facilities. river access and camping available. There is parking, restrooms, river access, and picnic facilities available.There is lodging, food and phone available within a quarter mile. From Rt. 6 south on Rt. 187, 3.5 miles, left on SR 2014, 1.8 miles proceed right on SR 2014, bear right on TR 467, 1 mile to access site, river on the right. There is parking, restrooms, river access, and picnic facilities available. This site is reported to be the site of a small village on the east side of the river and mills on the west side connected by a ferry. The site/mill was named after Charles Homet who fled from France and in 1815 he was the next to most wealthy man in Asylum. From Rt. 11 in Bloomsburg, turn south on Rt. 487. Turn right just before the East Bloomsburg Bridge onto Fort McClure Blvd. Town Park offers many acres of recreational activities including baseball fields, soccer fields, tennis courts, basketball courts, a fitness trail, the Bicentennial Entertainment Pavilion and a Skate Board Park. Also available are picnic pavilions, charcoal grills and a lagoon that is stocked with fish for an annual fishing derby. There is also a carry-in river access. Lodging and food are accessible within one mile. Today, this natural and historic greenway extends between the Veteran’s Memorial and Market Street Bridges along the west banks of the Susquehanna River. This pastoral grassy setting is used by picnickers, walkers, and boaters gaining access to the river from a newly upgraded launch and parking lot. This is a paved access with parking, picnic pavilion and lodging, food and phone located within one mile. Parking, restroom, picnic pavilion, river access, and camping are available. Lodging, food and phone are located within a quarter mile. Shikellamy State Park is located at the confluence (meeting point) of the West Branch and North Branch of the Susquehanna River. It is divided into two main sections comprising of the Overlook on the western shore of the West Branch of the river, and a Marina on the southern portion of Packer's Island along the North Branch. Bald Eagle State Park, Centre County, is along PA 150 between Milesburg and Lock Haven. Park activities include: picnicking, swimming, boating, hunting, fishing, hiking, camping, sledding, ice fishing, ice skating. Take I-80 west to Milesburg Exit 158, then Alt. US 220 south for 6 miles. Turn right onto PA 504 west for 12 miles to the park. Park activities include: hiking, mountain biking, picnicking, swimming, boating, fishing, education, skiing, snowmobiling, ice fishing, ice skating, ice boating, camping. Along River Road, north of Route 322 bridge in Clearfield. This riverbank park was created by a Clearfield couple in memory of their beloved dog and features benches, picnic tables, river views, seasonal decorations, and wood carvings. The park is privately developed and maintained, but is open to the public. Please respect this private property. Both parks are accessible from North Front Street in Clearfield Upper Witmer park has a playground and walking track for the kids and adults to enjoy and lower Witmer park is home to festivals such as the River Front Festival in the summer and several music events and a great place to enjoy the river and ducks. In Curwensville, take Susquehanna Ave/Route 453, to Irvin Park Road. The park is mostly wooded, level and well located to serve the residents of the community and surrounding areas. There are four family sized pavilions available for picnics and reunions. These pavilions may be reserved by calling the Borough Office (236-1840). Irvin Park provides a nice band shell and is the setting for the Curwensville Days celebrations during one full week in the month of July. This recreation area is on the shores of Curwensville Lake and offers many activities such as boating, volleyball, hiking, fishing, and camping. Off of Route 150 in Lock Haven Riverview Park, on the banks of the West Branch Susquehanna River, offers recreational facilities, wildlife viewing, birding, children's play area, paved hiking/biking path. Park amenities include: pavilions, picnic areas, volleyball and boat launch nearby. Bucktail State Park Natural Area is in north central Pennsylvania and follows PA 120 from near Lock Haven north to Emporium. Scenic driving, canoeing and kayaking, fishing, hunting. From PA 120 at the village of Hyner, turn east onto Hyner Run Road (PA 1014) and travel for two miles, turn right onto Hyner View Road. It is a five mile drive to the view. Park acitivities include: hiking to the scenic View, picnicking, hang gliding, and hunting. Park activities include: hiking, picnicking, swimming, fishing, hunting, snowmobiling, camping. From I-180/220, take exit 23B toward Montoursville/Warrensville Road. Merge onto East Third Street/Old Montoursville Road. Turn right at Canfield Lane then turn right at Greevy Road. The park entrance is on the left. This 56 acre park includes Canfield Island National Historic Site and James P. Bressler Heritage Trail, the Greevy boat access, and access to the Loyalsock Bikeway. Riverfront Park also contains a pavilion, several fishing access points, and a large multipurpose field. From US 220, take the Reach Road Exit. Turn right onto Reach Road. Turn right onto Arch Street. The park entrance is on the right side of the north side of the Arch Street Bridge. Picnicking, souvenirs, riverboat tours, boating, fishing. Corner of Center and Front streets, in Milton learn about downtown Milton at an interpretive kiosk, or rest on a bench at this pocket park. Along Front Street in Milton enjoy river views, a gazebo, and interpretive kiosks at this local park. The community music in the park series is held here in the summer. Along Walnut Alley in Lewisburg This quiet pocket park provides lovely views of the West Branch, benches, and native flowers planted in memory of Mariah Quant. It has been planted with native species as part of the Chesapeake BayScapes program and is maintained by the Borough of Lewisburg as a public park. Along North Front Street, between Market Street and St. John Street in Lewisburg This 2-acre riverside park has numerous benches, picnic tables, and ample shade is provided from mature trees. From this park a visitor has a wonderful view of the town’s largest historic bridge: The circa 1900 steel truss bridge spans the West Branch of the Susquehanna. Additionally two circular stone-masonry bases for the former water towers associated with the Lewisburg Waterworks Company (est. 1883) are located in the park. This 82 acre park located on the island between Milton and West Milton features a variety of activites that offer both a fun, recreational day out, as well as a calm, relaxing time in nature. Shorter walking paths along the middle section of the park are perfect for those seeking some light exercise. In 1807, Daniel Miller set aside nearly 20 acres of land for public park space in his original plan for "Milersburgh". Today his legacy is used by thousands of residents and visitors as Millersburg River Front Park, a gateway to the Lykens Valley Rail Trail and site of the historic Millersburg Ferry. 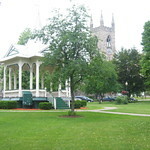 The focal point of the downtown business district, the area includes war memorials as well as the historic gazebo. Built in 1891 for outdoor concerts and public meetings, the structure remains the centerpiece of the town. 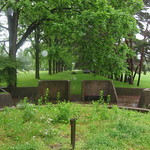 This picnic and recreational area was established by returning WWI veterans in 1919. Originally known as "Water House Grove", the name was changed in the 1930s to Millersburg Youth Organization (MYO) and hosts nature trails, athletic events and public gatherings. Spectacularly located on a bluff overlooking the Susquehanna and Blue Mountain, Fort Hunter Park consists of about 50 acres. 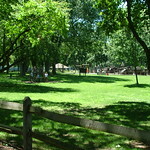 Donated in 1980 by the Meigs family, the park includes ten historic buildings, a walking trail, two picnic pavilions, two sets of playground equipment and a play field. The park offers a variety of programs and festivals throughout the year and the Mansion is open for guided tours. City Island Park is located in the middle of the Susquehanna River, just opposite the city of Harrisburg. Known for being a popular tourist destination for those visiting the city, the Island has many recreational opportunities such as an boating, biking, hiking, an arcade, mini golf, baseball stadium, beach, and more. However, those looking for a more scenic, peaceful day on the island can take a nature walk through several trails. 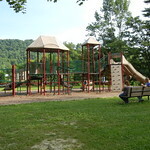 A playground is also located near one of the trails, as well as the Skyline picnic pavilion. This public park, located on the outskirts of Harrisburg, sits right on the edge of surburban and urban culture in the area. A great place to visit with family as you are able to enjoy the wonderful trails as you take part in the wildlife that surrounds you. Be sure to bring a camera to truly capture the moment. Come inside to the Nature Center to check out the exhibits and learn more information about the area. From US 322 , take the Fishing Creek Exit. Turn east onto Fishing Creek Valley Road (SR 443). The conservation area is 2.6 miles on the right. Marina includes a few boat access points as well as Safe Harbor Park, Cabin Branch Creek Park, and Kline's Run Park. Provides pavillions, boat access, fishing, swimming, trails, playgrounds. Samuel S. Lewis State Park is in south central Pennsylvania, York County, and is about 12 miles east of York, Pennsylvania. From the Wrightsville exit of US 30 follow Cool Creek Road south about 1.5-miles to Mt. Pisgah Road and the park. 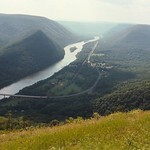 This 224 acre park in Lancaster County offers an amazing view over the Lower Susquehanna River. Located on a wooded plateau, visitors often come to Susquehannock State Park to visit the overlooks above the river, which feature observation decks. From 380 feet, you can see a panoramic view of the Susquehanna River, as well as the Conowingo Reservoir, Mount Johnson Island, and a variety of wildlife across the landscape. We are always adding content. Do you know of a park or trail along the Susquehanna River that should be included? Contact epierce@susquehannagreenway.org with more information.